"Meier" is an US registered brand and is owned by company Meier Collection Inc. "Meier" is a high-end product line and provide formal social occasion gowns for the upscale, high fashion woman. The Meier Collection of evening gowns and formal dresses is adorned with plush details of European lace, rhinestones, artistic embroidery and exquisite draping. 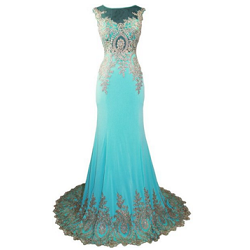 Formal ball gowns, mermaid dresses and slim sheaths in an array of colors allow The Meier Collection to be worn for a variety of special occasions. Beautiful gold embellishments with sparkling rhinestone on body and at hem! The top is a sheer scoop neck that extends to the back, making the entire top half of the gown see-through and slightly scandalous. The hem coordinates with the beading on the bodice; a thick band of beading curls along the bottom and scallops the hem. The train in the back makes this dress perfect for bustling.